This project is based on my first design of 12v Multi Power Supply which you can also find on this website. The reason for the design of Version 4 is that I wanted to add Arduino managed Dew Controller for both my main scope and guide scope. To add the logic to the existing design and box was not possible as I had to switch from an Arduino Uno to an Arduino Mega. The reason is the additional pins needed and instead of increasing the size of the box, I started to think in a more modular fashion. The solution I decided on was to create 4 modular brake out boxes, each with there own function which will sit close to their telescope controls while the main box will sit on the pillar. Yes, I know this defeats the object of the initial design in reducing the number of cables going up from the pillar to the mount as this design increases the number of cables from 2 (as per the original design) to 4, for this design. Reduce the weight on the scope, as the Management Box will not reside between the main scope and the guide scope. As the box will not be sitting between the Scope and guide scope, I do not need to take into account mounting holes for the box on the scope. No need to make sure the mounting holes are perfectly aligned. Maintenance of the box will not require the removal of the guidescope and therefor possible guidescope alignment. Number of cables going up the mount increases from 2 to 4. There might/are more benefits/downsides, but the above are the main for my setup. DSLR Camera power & USB2 connectivity. Dew heater control for main scope and guide scope (with temp measurement for both dew bands and ambient temp). Power control for Astro EQ (on both USB & power) & DSLR Camera. The 4 external modules are connected to the main management box using standard DB9 cables. This is it for the moment, but will be adding more over the next few weeks. I will provide details on each of the modules. This is the easiest module of the 4. Each motor (Filter & Focusser) requires 4 connection. 8 connections in total, leaving 1 unused connection. Pins 1,2,6,7 are used for Motor 1. The focusser and filterwheel motors are connected using the 4 pin GX16 connector each. Pins 1 & 5 provides 12v & Gnd. Pins 6,7,8,9 provides the USB2 connectivity. 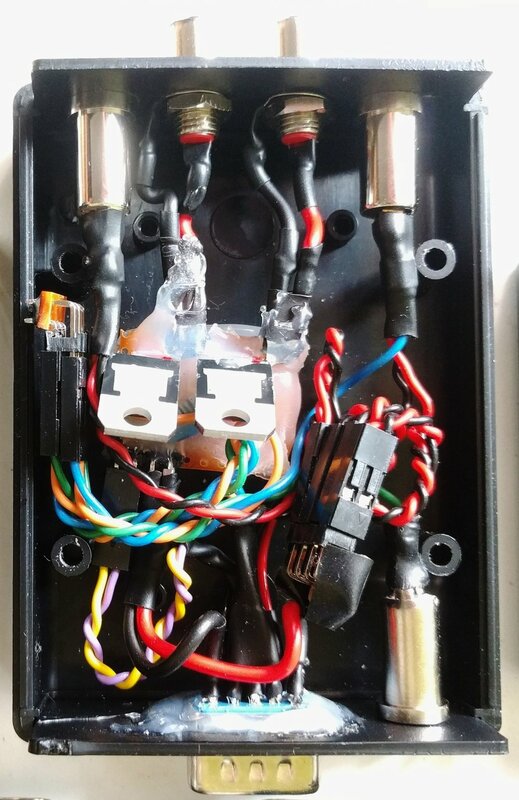 This module provides 12v and a USB2 connection to my Astro EQ device. Pins 1,5 provide the 12v & Gnd. Pins 6,7,8,9 provide the USB2 connections. Besides the DB9 connector. We use here a 3.5DC jack and a USB2 module.